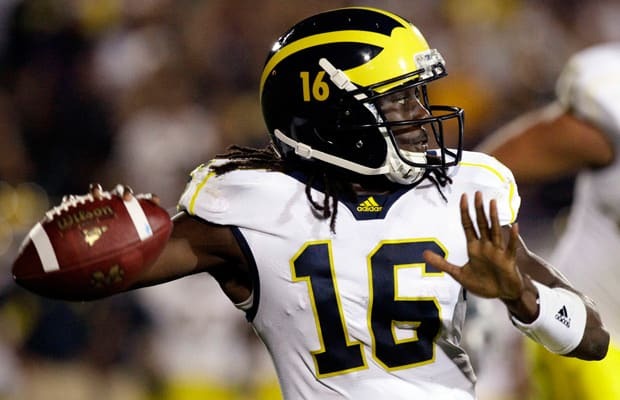 Does Denard Robinson give Michigan a better chance to win if he plays WR and Devin Gardner plays QB? He’s going to have to play wide receiver in the NFL, but you don't play guys in college because they'll make better pros at a particular position. You put them where they can help you win. If I was the head coach, I’d put in a package with both him and [Gardner] the field together. Both guys are versatile enough to move them around. You’re going to have to figure out what to do with the two of them anyway. They've also moved Gardner around at wide receiver this year, too. No matter what, they’ll be a good offense this year.